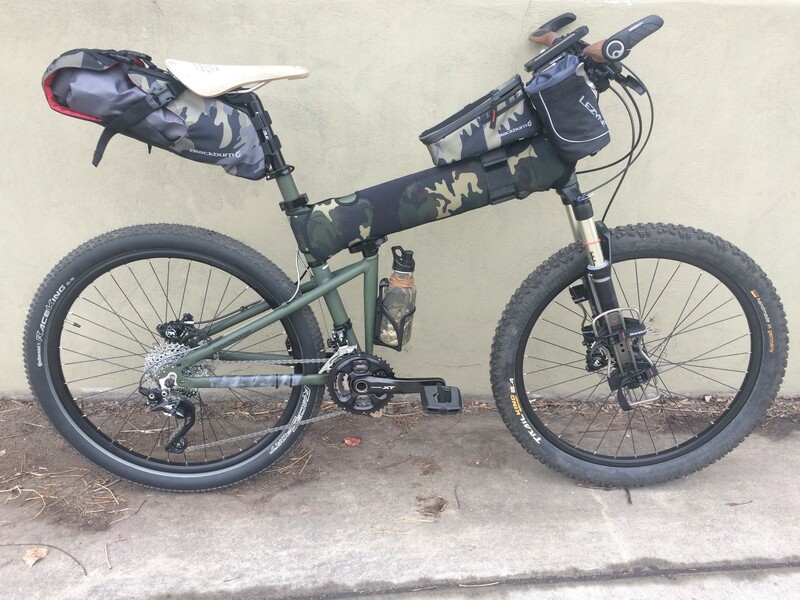 Setting up a Montague Paratrooper for bikepacking. It all started with a dream - to escape the day-to-day and explore the high-country with only a bike and a few essentials. First order of business was to set up a bike. I have an old full suspension Rocky Mountain Slayer from almost a decade ago - still quite functional but very heavy and with 160mm of suspension travel front and rear it offers way too much suspension for my taste and for this purpose. Plus, I'm in the business of folding bikes so that is the way to go. I've been talking with Montague for most of a year, waiting for a used or blemished Paratrooper frame for just such a purpose and as luck would have it, earlier this week one arrived. It is a current model Paratrooper frame, 20" in Army Camo Green. I've been sitting on a complete parts kit from a 2014 size XL electric mountain bike that is the perfect parts donor for the Montague frame since it has 26" wheels, Shimano XT drivetrain, and a nice Rock Shox Reba 100mm suspension fork. Once the frame arrived from Montague, it was about an hour project to move everything over. A few cable adjustments and it was set to go. I decided to swap out the saddle for a nice Brook Cambium C17 and the grips for a more ergonomic set of GP3 grips from Ergon. Here is how the bike looked after initial setup. Given the color of the bike I decided to go with a Camo theme for the build. 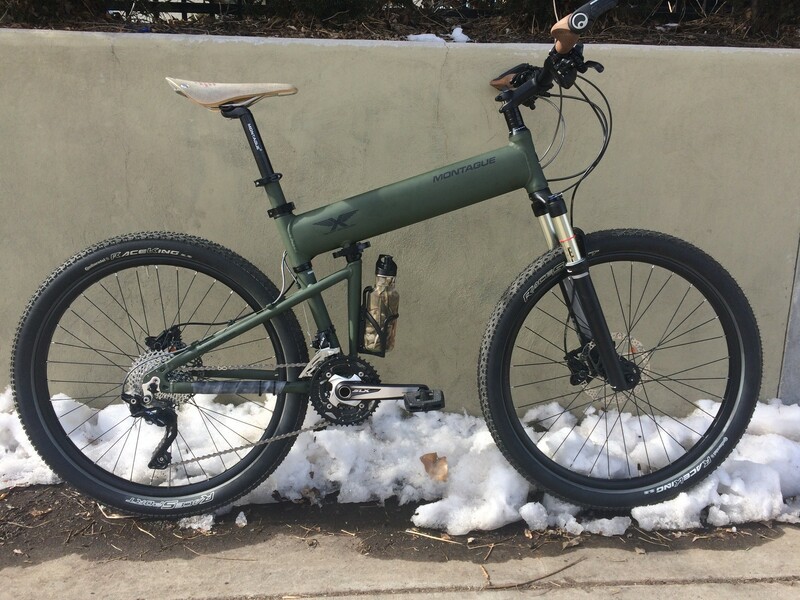 First I ordered a protective neoprene frame cover in green camo from the Montague distributor in the UK (https://www.montaguebicycles.co.uk/). Then, after much research on the best and most cost effective bags, I chose the Blackburn Outpost series (https://www.blackburndesign.com/bags/outpost-bag-collection.html) seat bag and top tube bag, both of which are offered in Camo - score! I elected not to use the front handlebar roll-up bag but instead went with two Outpost Cargo racks that I will mount on the lower legs of the suspension fork. Since the fork doesn't have mounting studs, I called up the owner of King Kage in Durango, CO (http://www.kingcage.com) and ordered up a full set of their Universal Support Bolt (USB) devices. These are nifty little hose clamps that have a short bolt welded to the main clamp section. When clamped to the fork leg, I can then bolt the Outpost Cargo racks directly to the USB. I will strap light items like my sleeping pad and rain gear etc... to the front cargo racks. I expect that trail food, camera, tools etc... will go in the top tube bag, sleeping bag will strap to the handlebars, and the rest in the seat bag. Until it all gets set up I won't know for sure.